Visual Studio will automatically do any merges. Since there are were no conflicts, the auto-merge was successful and created a merge commit. Now you can simply Push these changes up to the remote. Here’s what the corresponding scary message looks like from command line. 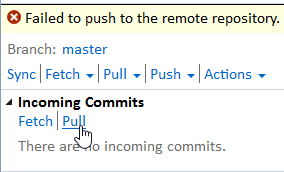 You’ll first want to Git Pull – which will result with Notepad prompting me to update my merge commit message if needed. And now in Mortal Kombat fashion (I spelled Kombat right this time), you need to Finish It! and do a Git Push. A few weeks ago I tried to figure out how to do this, but to no avail. I couldn’t find an answer because the solution is a more of a generic “catch-all” command to get lots of info about a remote, including figuring out which branches were newly added to a remote. Note how next to the circled `saraford-patch-1` you see the text `new (next featch will store in remotes/origin). Now I know what new branches (if any) I’ll “fetch down” the next time I do a fetch. Obviously this command shows other goodness, like seeing which local branch talks to which remote branch, and more importantly, what “origin” (or some other specified remote) points to. Thanks to Jeff (blog comments) for the pointer to `git remote show origin` which answered my question! As shown in Tip 118 – how to download and merge commits using Pull in Visual Studio, today’s tip rinse and repeats from the command line. Unlike this past week, you are ready to fetch changes and merge them all in one command: Pull. First, checkout the desired branch. And git will perform the fetch and merge all at the same time. *I think my greatest obstacle in learning git commands is knowing when a command or subcommand wants 1. a remote 2. a branch name 3. nothing at all. Has anyone tried nursery rhymes yet to learn git commands in the same way we learn the names of the planets? I really need to get back into standup comedy. Today’s tip is the continuation from Tip 118 – how to download and merge from a remote branch into Visual Studio, but using the command line. Let’s suppose you have a local branch that’s tracking the remote branch (see yesterday’s tip). And let’s say someone has made an update to that remote branch (e.g. 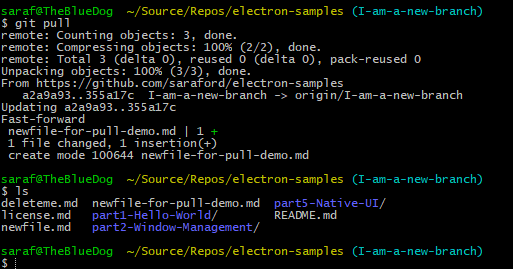 they made a commit `newfile.md` via the GitHub UI to the branch). Now you want to get those changes into your local branch. First, we’ll put this week’s earlier tip to good use by doing a `git fetch` just to get those changes onto your computer. Now you want to merge those changes into your local branch. First, make sure you’ve checked out the desired branch to receive the merge. And now if you do a `dir` or `ls` you’ll see the changes. In my example, the newfile.md is now shown in the local branch. In Tip 116 you saw you to create a local copy of a remote branch in VS. In today’s tip, you’ll learn how to do this from the command line. First, let’s verify our current list of branches. It seems that you don’t have to specify the `origin/` part. 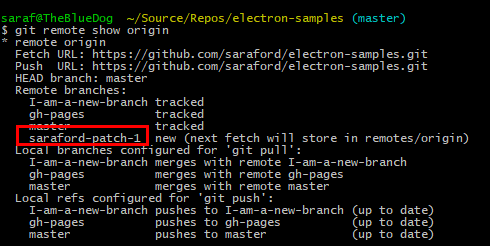 Git knows to look for corresponding tracking branches. And you’ll have your local branch. As I’ve mentioned time and time again, I hate shortcuts when learning things for first time. This SO answer tells me there’s a more complete way. I gave this a try with my gh-pages branch and sure enough it worked! In Tip 117 you saw how to fetch down updates from a Git remote in Visual Studio. Note: I said “fetch down” instead of “pull down” because tip 117 only fetches the data. The result is the data for the remote tracking branches is updated, but not applied to your local branch. Hence the “incoming commits” terminology in Visual Studio. Today you’ll see how to rinse and repeat for the command line. First, let’s verify the currently listed branches our local remote is aware of. Second, let’s add a new branch to the remote on GitHub. Third, let’s sanity check that no magic sync’ing has happened behind the scenes. And you’ll see the same number of remote tracking branches. (yes, I took a second screenshot. I’m too lazy to think about optimization 🙂 TBH I have to verify what I’m writing here! I know you can do just `git fetch` but I don’t like learning shortcuts first. I’m not sure if the branch on the left is the remote tracking branch or if it is the one on the right. My guess is the one on the left hand side represents the branch from GitHub and the one on the right represents the remote tracking branch. Nonetheless, you now have a new remote tracking branch as shown below. Ah Git. It is the gift that keeps on giving if you’re into studying developer tool usability. Suppose you wanted to get the last commit ID and message while listing all your branches. The `–verbose` or `-v` for short will provide you with that information, e.g. If given twice, print the name of the upstream branch, as well. (see also git remote show <remote> ). you’ll get even more information! Note the blue text depicting the upstream branch. *Specifying the –verbose option twice reminds me of old school text-adventure games where you’d have to look twice in the same location to find a second item. If you thought to do that, you’ll get a bonus or something. Now I might have to search the Git documentation for the common commands to see what other options exist where you have to specify a parameter twice! P.S. I can’t find in Visual Studio where to see the upstream branch. You can see all remote branches in the history view, but that’s not quite the same. Perhaps since in Team Explorer (as far as I can tell) 1. you can’t rename a branch checked out from a remote tracking branch and 2. can’t checkout more than one remote tracking branch, it’s assumed that the upstream branch has the same name as your local branch. That’s my guess.